I see I haven’t written in a long time, but I have been very busy, doing lots of traveling, Turkey, Costa Rica and Barcelona. I’ve been working through the fall and winter on a new series, ‘Between a Rock and a Hard Place.’ This is a feeling that I have in many situations and relationships in navigating all the complexities of decisions, friendships and family, and just trying to be a good person. I’ve been thinking a lot about immigration, the ‘wall’, race issues, women’s issues, etc. It can be very disheartening, especially with the current politics in Washington. I’m continuing to use rocks and feathers in some of these images, as well as some marks that represent barriers and pain, and also hope. I was listening to Buddism 101 on a CD while doing some of this work and contemplating suffering as part of our human condition, and feeling very sad about how little progress we seem to make in our evolution around compassion. Some images that came out of this time are here. I was back in San Miguel de Allende, Mexico for 5 weeks earlier this year, continuing work on my series on 'Mujeres, Diosas, y Guerreras' based on my inspiration of women and female goddesses. This series uses images of current and past female images, some from my own photographs and drawings. I am using a xerox transfer technique in black and white, which I will add color to with some inks, pastels and watercolor, as well as some chine colle. I also kept a travel sketch booking journal. Some images are here of work in progress and journal entries. During June and July of this year I traveled to Rwanda as a chaperone of a group of Boston HS students on a service trip. I do this as part of a non-profit organization I am on the board of, The Jon Walker Kerry Fund. We have a relationship with a HS for orphans and spend two weeks there doing service work and becoming part of a 'family'. It's a life changing experience on many levels. Since my return I've been struggling with how to integrate my feelings and experience with my art. I am inspired by the colors of Rwanda, red dirt green hills, dark skin, yellow sun and the many colors of the fields and grasses. Most Rwandans are very religious, believing in Christianity while also incorporating many of their cultural spiritual beliefs. I don't think I've been around people who are more positive, affectionate and appreciative, It's hard to believe that the genocide of nearly a million people took place here just over 20 years ago. The Rwandans have chosen love over hate and hope to never repeat the divisions of the past. Dance and music are a big part of their world. So some images and colors have begun to emerge from this experience for me, as well as a title, ' Forgive but don't Forget.' This is still a work in progress. Some images I'm working on are here. 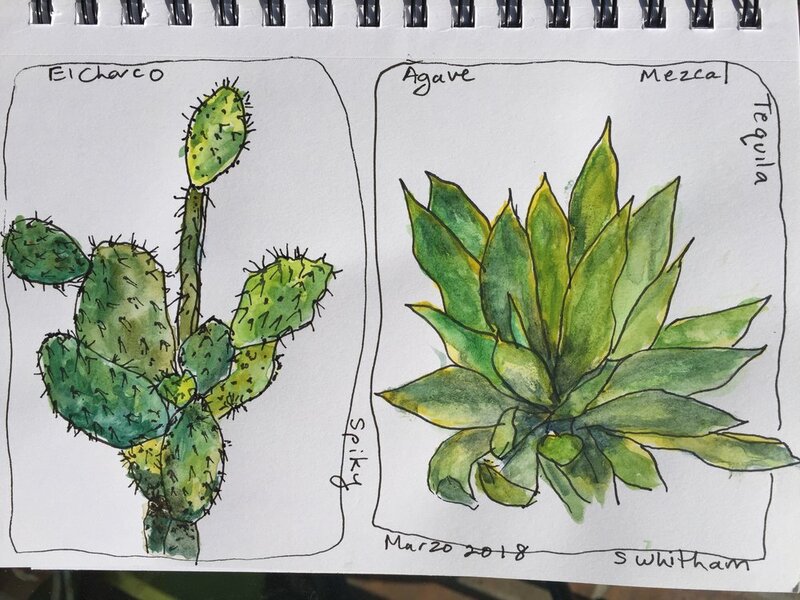 Spent another month in San Miquel de Allende and learned some new printmaking techniques from a wonderful fellow printmaker, Linda Soberman. She uses a xerox transfer process with pure acetone. its the best I've used for a complete transfer. Just make sure you have very good ventilation. Working on a new series, 'Viva Mexico', strong female images. Here is the Virgin of Guadeloupe with an Aztec Goddess. Just back from a long season on Cranberry Island with lots of new work. New pieces have been informed by recent political landscape as well as more literal landscape. Working on some heart rocks and wishing stones in studio. Thinking about a project of many small prints of individual rocks. Over the past few weeks I have been experimenting with fabric and paper - shibori , rust and eco-dyeing, as well as paper-making, stitching and more. I'm looking to incorporate some of this into my printmaking. Just finishing a month of exploration and wonder in every possible way in San Miguel, Mexico. I've been wandering, painting, sketching, photographing and taking lots of workshops. I've been working with encaustic monotypes and incorporating other materials into my prints. I'm so inspired by all that I've experienced, and can't wait to get back into my studio in Boston.